The best way to view a traditional Chinese landscape painting is to “read it,” according to the Chinese, because the painting is not just a representation of the beauty of nature but also contains deeper meanings. Often the painter will add a poem that extends the painting’s motif. Chinese landscape painting embodies the skill of the artist and his mastery of Chinese calligraphy. These two are inseparable when it comes to Chinese landscape painting. Considered the highest form of painting in China, Chinese landscape painting started and flourished during the Five Dynasties and Song periods. 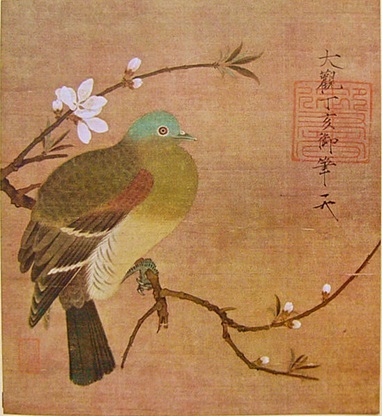 Emperor Huizong of the Song dynasty was a very accomplished calligrapher and landscape artist. The single most outstanding element of Chinese landscape painting is that each stroke of the brush is a defining move. It has to be precise because it cannot be corrected nor improved. The drawing is directly painted without any preliminary sketching and often no model is needed. The subject comes from the artist’s memory, embedded deep within his mind from long years of study and observation of nature and people. This tradition is very different from the West, where watercolor artists sometimes do sketches on paper, make corrections to their watercolor paintings and at times, overpaints part of their work. In Chinese landscape painting, the object is not just a representation but also a symbolic manifestation. A full plant is never rendered, just a few branches with leaves and blossoms that already represent the entirety of the plant. In constructing a Chinese landscape painting there are two elements that are traditionally present: a Host, shown as the stronger or larger tree, flower or any object and a Guest, which is shown as a smaller object. The harmony and beauty of Chinese landscape painting came from Chinese calligraphy, with orchid and bamboo as the first two subjects, which were the favorite subjects of the ancient masters of Chinese landscape painting. These two subjects may appear simple to someone who does not have any background information of Chinese art, but they are actually very demanding and complex. The revered master Hsieh Ho created the Six Canons of Chinese landscape painting in the 5th century AD and these are still in use today. The heart of the artist is presented with the production of the life’s movement called the “circulation of the ch’i,” which is the vital force of heaven, spirit and breath. The painting’s bone structure is created by the brush strokes. The painting is stronger when the artist employs strong brush work. The painting’s character is produced by combining lighter and strong brush strokes, and by using dry and wet techniques and using thin and thick lines. Form is drawn according to the object, which means that the object is drawn as the artist sees the object. This is achieved by understanding the object’s form, which may not be a realistic rendition, but by how the artist viewed it, a skill that the artist develops by thoroughly studying the object. For the Chinese brush artist, black is a color and thus Hsieh Ho wrote that according to the object’s nature, color should be applied and in this case, the range of shadings that a highly skilled master artist could create produces the colors or impressions of them. Still, color could be used but they must be as close to the true color of the object or subject. Elements should be in their proper places when the composition is organized, with space treated as an object and is an essential part of the painting’s composition. A student is allowed to copy the work of a master, but only when the student had already learned the proper techniques, meaning the methods and essence of the brush of the master. Initially there were only two subjects, the orchid and the bamboo. Later two other favorite subjects emerged, the plum blossom and the chrysanthemum. Each one has its own meaning. The orchid is the symbol of spring, which denotes hope, because of its modesty and unity. Summer is represented by the bamboo, which symbolizes perseverance, flexibility and endurance. The beautiful large blossoms of the chrysanthemum represent autumn and life’s triumphs through fortitude, patience and persistence. Plum represents winter, as it symbolizes the secret promise of rejuvenation, renewal, as well as the continuous hardiness and continuity of life. Rendering these four objects, also called Four Gentlemen, could be formidable. It requires the subtle expression of the spirit, precision in the employment of traditional techniques in the application of brush strokes and very strict discipline from the artist. The objective is always to express the subject’s inner essence and personality by following its form. Chinese brush artist visualizes a written idea, using the movement of the brush as its aesthetic element. The bone work of the painting gives it its muscle and strength. Bone work used to paint the twigs, stems and branches should have the strength to compliment the delicacy of the flowers. Chinese landscape painting might look simple, but when you understand the story and work invested on it, you would see that it is very complex and reflective.